Thank you Vistaprint for sponsoring this post. While this was a sponsored opportunity from Vistaprint, all content and opinions expressed here are my own. It’s starting to get cool outside and you are probably thinking, “How is it October already? 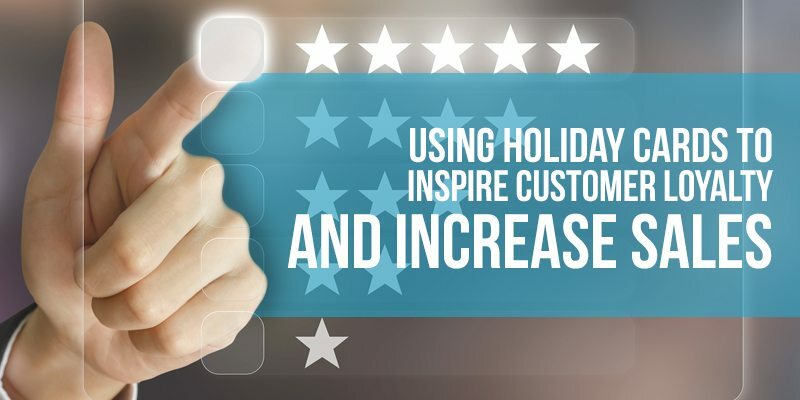 It’s going to be December before I know it.” The reality is that time flies and it is never too early to start thinking about how your business can inspire customer loyalty and increased sales during the holiday bonanza. One good way is to use holiday cards. The best way to illustrate how something works for small businesses is to use an example. Enter: Tommy’s Threads, your friendly neighborhood retail store (fictional). Tommy sells new clothing, primarily to local customers. He also provides custom tailoring services as well. As the holiday season approaches, Tommy is wondering if he should give holiday cards a try. 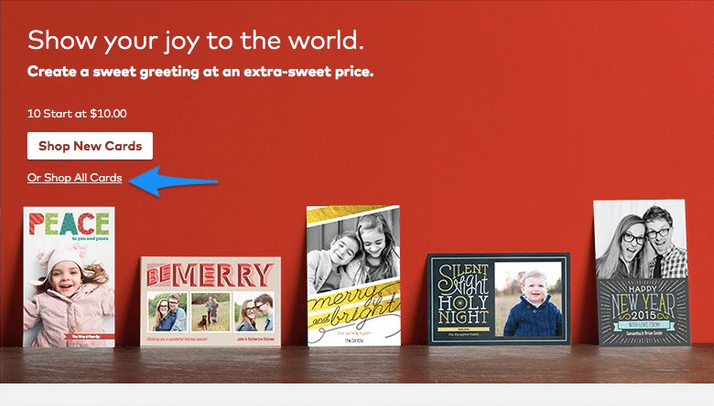 Why Should I Spend Time and Money on Holiday Cards? 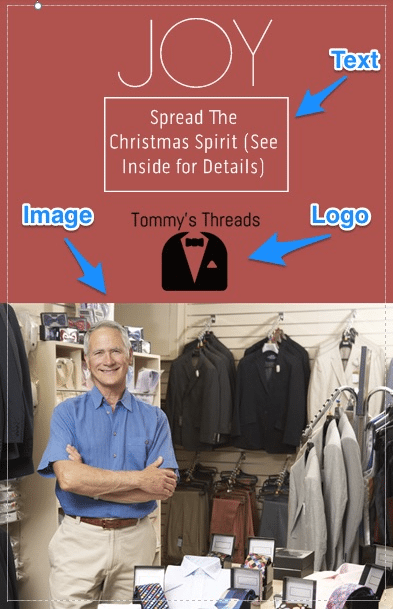 Holiday cards will put Tommy’s Threads front and center in the consumer’s mind during one of the most purchase-oriented times of the year – Tommy wants his business to be the first clothing business local customers think of when they want to buy. What better way to do that then by sending out a card that will get delivered right to their home, and hopefully end up on their refrigerator? 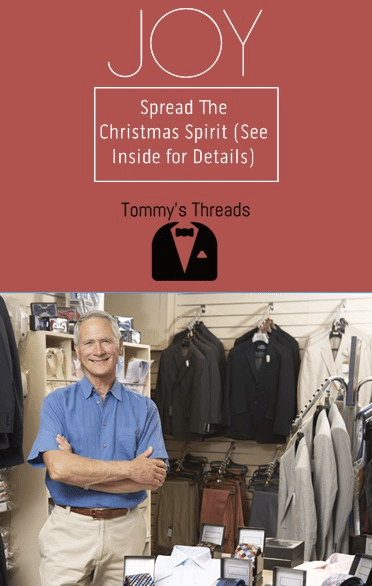 It gives Tommy a chance to further his brand – Tommy’s Threads is all about providing outstanding value to its customers, whether via its clothing options or its tailoring service. 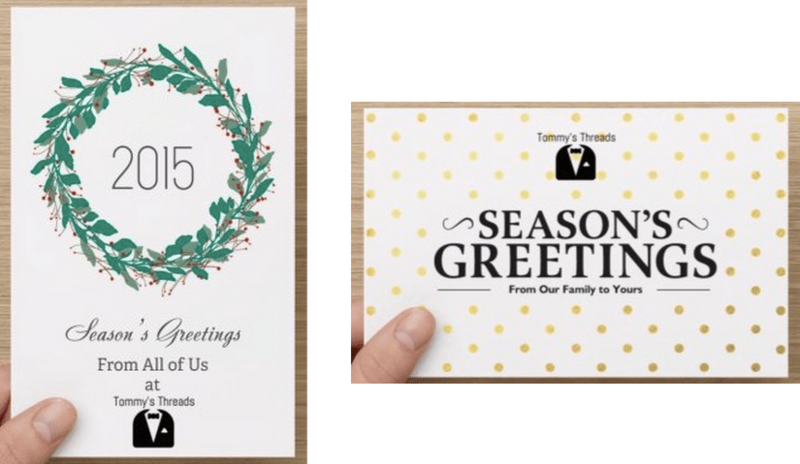 By sending a holiday card, Tommy gets another chance to remind customers what he is about, both via the text on the card and the images as well. It is a physical reminder of Tommy’s Threads – In a world dominated by websites, apps, and digital marketing, business owners sometimes underestimate the power that a tangible card can have. 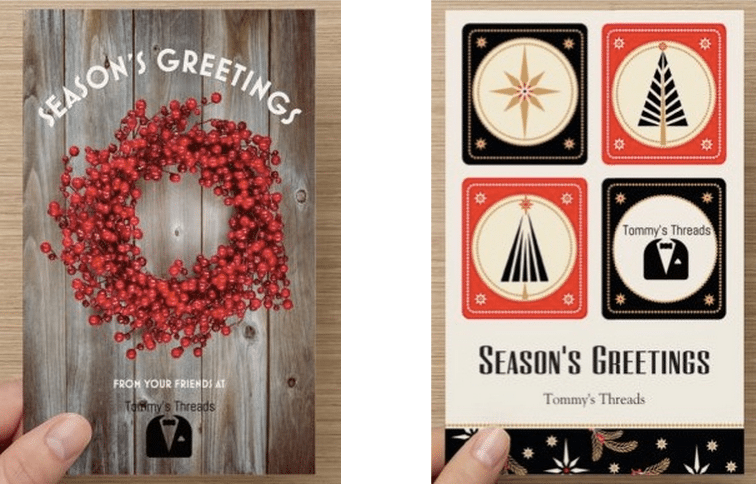 Tommy knows his holiday card will set him apart, serving as a physical and tangible reminder of his business in the hands and homes of his customers. If crafted correctly, the holiday card pitch will be well received by local customers– In general, people are more charitable and good-spirited during the holiday season, especially to local businesses that they have relationships with. If Tommy’s pitch is crafted effectively and taps into that sense of goodwill, it has a great chance of being received well and inspiring customer loyalty and action. Tommy realizes that his customers will probably get quite a few holiday cards and he wants his to stand out from the crowd. 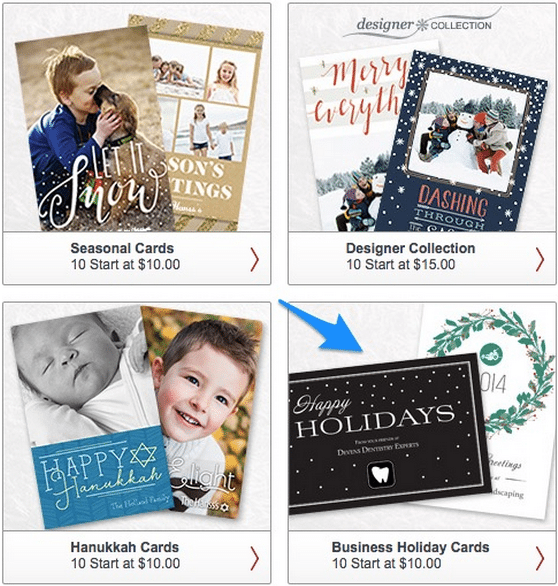 After a lot of research and talking with other business owners who have used holiday cards effectively, Tommy found four primary elements that made holiday cards stand out. If you want your holiday cards to stand out as well, make sure you have incorporated these four elements. Don’t try to do too much – Holiday cards with too much information will just confuse customers and get thrown in the trash. Narrow down exactly what you want your holiday card to accomplish and then highlight that information. Don’t get too crazy with your fonts – Stick with some of the classic fonts such as Helvetica, Myriad, Adobe Garamond, or Bodoni (formal). This is extremely important. You need to know what you want your card to accomplish so you can know what text should be added to best inspire customer action. Here are some tips to create a good call-to-action. Have one specific goal – What do you want your customers to do as a result of seeing your card? To buy something, to come on a specific day, to refer a friend? Having one goal will help you focus your text and keep things simple. Keep it between 1-3 sentences – Don’t write a book. The shorter your call-to-action the less likely your customer will lose interest or get confused. Make Sure It Will Bring Customers to Your Store – Whatever your call to action, it should eventually result in customers coming to your store. More people in the store means more personal interaction (to build customer loyalty), more sales, and an increased chance for impulse buys. The card pictures a prominent local wearing Tommy’s Threads apparel at a local sporting event and reads, “Bring in a picture of you repping your Tommy Thread’s apparel at a local holiday event and get a free scarf with a purchase of $50 or more. As a local business owner, Tommy knows that the personal relationships and connection he has with his customers is one of the main reasons they come to his store instead of a major chain or online retailer. Highlighting that personal relationship is a major key to an effective holiday card for the local small business owner. Handwritten Message – A handwritten message is the best kind of personal touch for a holiday card. If you are sending out a smaller volume of cards, a personal message is a no-brainer. If you know many of your customers, be sure to include some little fact or detail about them to reinforce the personal touch. For example, “Bob, you looked great in your wedding with that Tommy’s Threads Navy Suit, hope you have been satisfied with it. Happy Holidays!” The point, is to remind your customers that you are a local business who knows their name/face, and appreciates their purchase, which builds customer loyalty and gives them a reason to come into your store instead of shopping at a chain store or an online retailer. Personal Signature – If you are sending out hundreds or thousands of cards, you may not be able to write a personal message. Make sure to at least include a handwritten signature as the bare minimum. The last step of the holiday card process, once you have your message, images, and content figured out, is to actually create your holiday card. 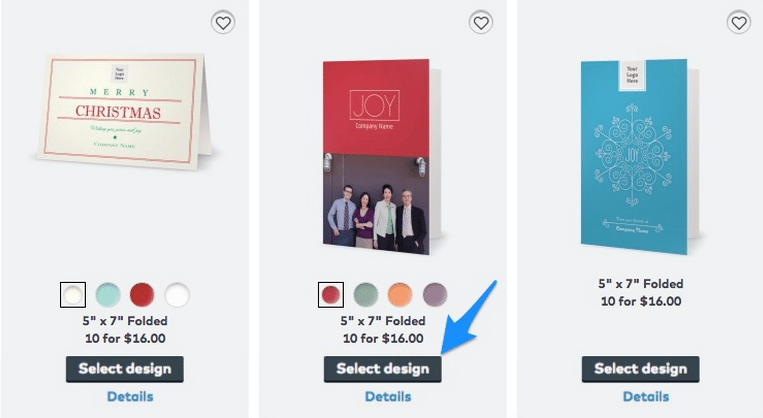 One of the cheapest and quickest ways to create a holiday card is to use a design and printing service like Vistaprint, which allows you to create cards using pre-made templates (or from scratch, it is just more involved). If you want to make a business card using on of Vistaprint’s premade templates, the process is fairly simple. Here is what you need to do. Click here to be automatically redirected to Vistaprint’s holiday card page and get a 50% discount on your purchase.